The Medical Marketing Semi set up recently on the campus of the University of Maryland at College Park. 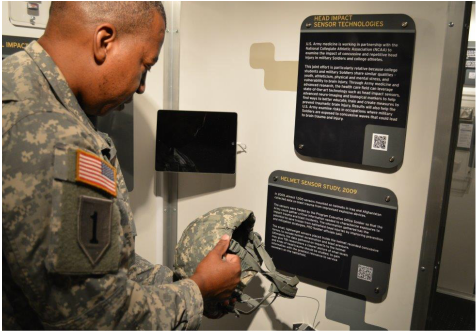 The Army's newest mobile exhibit highlights Army medical innovations, research and career opportunities. Army healthcare recruiters now have the ability to dispel some of the myths of modern Army medicine with a new asset designed to help win over the best qualified healthcare professionals in the United States. The Medical Marketing Semi rolled out to various university campuses across the northeast recently in a bid to better educate students, residents and working professionals about Army service and Army medicine. In the minds of many Americans, Army medicine still conjures up images of conscripts serving in dusty tents with dirt floors, with medics holding IV bottles and flashlights so the surgeons can do their life-and-limb saving work. While working in austere, battlefield environments is certainly one of the Army’s key capabilities, today most Army healthcare professionals actually spend 10 percent or less of their working career in operational medicine, and when they do, it is in modern, sealed, temperature-controlled mobile and fixed facilities with top-of–the-line equipment. To ensure medical professionals could have a clear picture of the realities of Army medicine, the MMS was conceived and initially designed by a working group consisting of representatives from several commands, including the Army Medical Recruiting Brigade, the Accessions Support Brigade; the Office of the Surgeon General and the U.S. Army Recruiting Command. The first round of stops for the new MMS was the 1st Medical Recruiting Battalion, headquartered at Fort Meade, Maryland. There, Army healthcare recruiters arranged stops at top-producing pre-health programs in the northeast, including Johns Hopkins, the University of Maryland and Georgetown University. The MMS helps attract pre-health students and medical professionals to hear more about Army Medicine careers and stimulates questions, according to Capt. Theresa Nowak, officer in charge of the Elkridge Medical Recruiting Center. “The audiovisuals and interactions at the SIM Man station, advances in burn care, prosthetics and bandaging were most intriguing to me,” said Nowak, an experienced Army nurse who served in Iraq. In addition to the MMS, the 1st Medical Recruiting Battalion’s healthcare recruiters arranged a series of information sessions with Army subject matter experts for pre-health students at each campus. During the session, an Army physician, nurse and dentist described life as an Army healthcare professional, and answered students’ questions. After several stops in the District of Columbia area, the MMS moved to Blacksburg, Virginia, to the campus of Virginia Tech for an official ribbon-cutting ceremony. Virginia Tech was specifically singled out for the ceremony based on the consistent large number of pre-health program graduates who apply for and receive the full healthcare scholarships available from the U.S. Army. Maj. Gen. Randal Fullhart, commandant of cadets of the 1,080-strong cadre at Virginia Tech, helped cut the ribbon. “This new exhibit van provides an opportunity to tell the Army and military medicine story,” Fullhart said. “It’s an inspiration to young men and women who are looking for a way to serve." Cpt. Eric Callens examines one of the displays inside the new Medical Marketing Semi. High-tech medical innovations developed by Army and civilian partners, including micro-current bandage technology, a malaria rapid detection kit, a portable oxygen generator and a noise-cancelling stethoscope. Highlights of Army research, including the prevention and treatment of infectious diseases and injuries as well as quality of life improvements, such as state-of-the-art prosthetics and the Army’s partnership with the NCAA to gauge the impact of repetitive head injuries. A SIM MAN Mystic 3G to demonstrate the Army’s commitment to realistic, high-tech training – the SIM MAN medical mannequin can simulate life-like symptoms and diagnostic scenarios, from a heart attack to a collapsed lung and other ailments. A section highlighting various opportunities for medical, dental and nursing students or residents, including full scholarships, payment of college loans, continuing medical education and other benefits of service.